Electric skateboards have redefined human recreation and transport. With excellent top speeds and mileage ranges, e-boards allow you to cruise through the neighbourhood or even commute to work. They are lightweight and as such, very portable. With flexible decks made of high-quality maple wood and fiberglass, electric skateboards are very attractive and with significant load capacities. With the increasing popularity of skating worldwide, demand for the best skating gears is on a steady upward trend. To meet the rising demand, manufacturers are continually introducing newer brands and models into an already overflowing market. The wide variety is, without a doubt, overwhelming the consumers. They are indubitably spoilt by the choice. In this review, we have rounded up some high-grade electric skateboards with unrivalled manoeuvrability, reliability, range, and speed performance. Check them out! 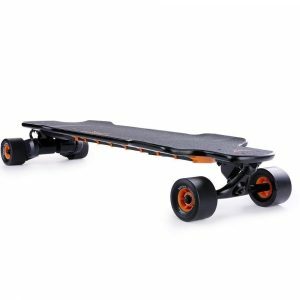 Inboard M1 e-board is expertly engineered with in-wheel motors for easy riding. Unlike mechanical belt and gear systems, in-wheel motors are more efficient and less break-down prone. They guarantee smooth rides even when the battery runs out of charge. It is powered by dual brushless hub motors. M1 premium electric skateboard is controlled by a proprietary algorithm, custom designed for smooth power delivery to the wheels. Compared to the usual off the shelf software in typical e-boards, M1 premium’s proprietary algorithm is better suited to regulate system’s heat dissipation thereby preventing overheating. Warranty: 12-month industry best warranty. Battery: High capacity swappable Li-ion battery. This e-skateboard is specially designed with premium snowboard fiberglass and flexible wood core. These features guarantee strength and durability. It has a 12-month warranty for free replacements and repairs. All manufacturing defects and performance malfunctions are covered. It is powered by a high-performance Li-ion battery capable of up to 7 miles range on a single charge. For an extended range, the M1 premium has a battery swap option that allows for easy replacement of flat battery on the go. It is water resistant, thanks to its snowboard fiberglass and flexible wood design. And in case you didn’t know, the Inboard M1 premium electric skateboard is approved for air travel. This is a 38” longboard powered by a single hub motor. Maxfind e-board is powered by a 500W single hub brushless motor. It comes with a 3.5” 90mm high grip wheels for unrivaled smooth ride experience. 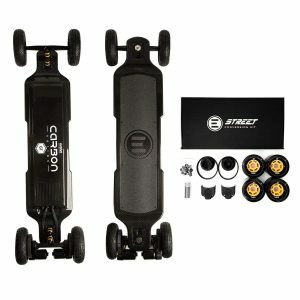 Maxfind e-board supports 2 riding modes; stiff deck flex and the cruiser modes. It is, therefore, suitable for entry level as well as experienced riders. It is remote-controlled. You can, therefore, regulate different parameters of the ride with a simple press of a button. What’s more, this e-board has a Manta drive system for conquering steep inclines. The deck is made of tough stuff for strength and flexibility. As such, it has a load capacity of 10.8lbs. Speed and hill climbing: max speed of 23mph & 30% grade hill climbing. 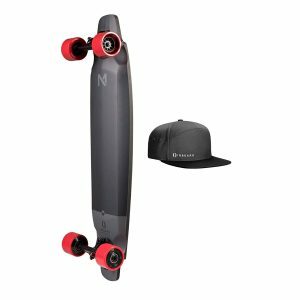 Maxfind electric skateboard supports 2 riding modes. It is therefore ideal for entry level as well as experienced riders. It rolls on 3.5″ 90mm high-grade Maxfind wheels for stability and smooth rides. This electric skateboard has a load capacity of 12lbs therefore suitable for lightweight riders as well as heavies. Supports 30% grade hill climbing. It is powered by a 500W brushless hub-motor which is more efficient compared to belt drive motor systems. Maxfind has a 6-month warranty for repairs and accessory replacements. Elevens e-board is very much like Walnutt Spectra and comes with characteristic posture and weight sensors. The sensors help with acceleration and braking. With a top speed of 10mph and a travel range of up to 10km, Elevens hands-free electric skateboard guarantees smooth rides for longer. And because it doesn’t support remote control, this e-skateboard allows you to take full charge of the ride. Acceleration is by simply leaning forward while deceleration is by leaning backward. That simple and you zip along streets like a pro. All accelerations and decelerations are regulated by the integrated speed control monitoring system. Speed: top speed of 10mph. Warranty: 12 month cover for the battery and the single hub brushless motor. Lifetime cover for the board and technical support. Its speed control monitoring system tracks body movements and as such, helps with speed regulation. Accelerate or decelerate your Elevens e-skateboard by simply leaning forward or backwards respectively. It’s that simple. No remote controls. It provides a 12-month warranty cover for the battery and the single hub motor & a Lifetime cover for the deck and technical support. Muttus premium electric skateboard & longboard is powered by dual 350W brushless hub motors. 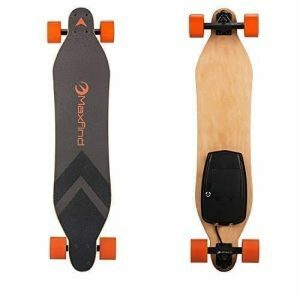 This premium electric skateboard has a strong, flexible and durable deck that supports a load capacity of 264lbs. It has high grip PU wheels for smooth rides. It is very energy efficient. Its high-performance cooling system guarantees efficient heat dissipation. Mattus premium e-board has inbuilt LED lights for easy navigation at night. It has a maximum load capacity of 265lbs, a top speed of 15mph and a max range of 15 miles. For comfort on the go, Muttus premium has a strong, durable and flexible deck made of high quality 7-layered maple wood. It is powered by energy efficient dual brushless 350W hub motors. For a smooth ride, Muttus e-board has removable and changeable high grip PU wheels. Mattus provides a 12-month warranty cover for all its e-boards. Get repairs and replacements done for free. It comes with inbuilt LED lights for easy navigation in dim light. It is has a max travel range of 15 miles and a top speed of 15mph. The Muttus premium electric skateboard has a load capacity of 265lbs and can, therefore, be used comfortably by overweight riders. The deck panel is made of a seven-layered maple wood for comfort, strength, and durability. This is a 37” motorized penny board with a top speed of 18.5mph and a 10-mile range. 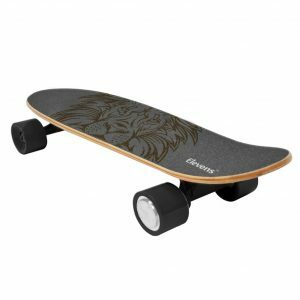 For comfort, strength, and durability, Teamgee electric skateboard has an 11-ply deck for comfort, strength, and durability. It has a high capacity Li-ion battery nicely disguised inside the deck for improved aesthetics. A sleek design with a solid build guarantees stability by keeping the center of gravity low. The double rear wheel Drivetrain ensures smooth acceleration and braking. With a top speed of 18.5mph and 20-degree hill climbing capacity, Teamgee e-board is best suited for high-speed street cruises. Control: wireless remote controls for acceleration, deceleration, and braking. Riding modes: supports 2 riding modes thus ideal for entry-level and adept users. Deck design: 11-ply maple wood for strength, durability, and flexibility. Warranty: 1-year warranty for free repairs and replacements. Teamgee has a high-performance Li-ion battery concealed within the deck. The high-performance battery has a 2 hour charge time and capable of up to 10 miles range. It is powered by a double rear wheel drivetrain and as such, has no bulky external motors. This system guarantees smooth acceleration with top speeds of up to 18.5mph. It comes with wireless remote controls for smooth acceleration, deceleration, and braking. Teamgee electric skateboard has a 1-year warranty for free repairs and replacements of defective accessories. It has 4 durable high grip polyurethane wheels for a smooth ride experience. Teamgee has a load capacity of 220lbs and can, therefore, be used comfortably by overweight riders too. Evolve Bamboo GT series electric skateboard features a tough, durable and flexible bamboo deck. A set of dual brushless hub motors deliver power to its high-grade wheels during rides. It is controlled by a special GT remote that features an LCD screen. Evolve has a super carve truck system for enhanced stability while also allowing tight curves while cruising. This e-board rolls on 83mm hybrid GT series wheels for smooth and comfortable rides. 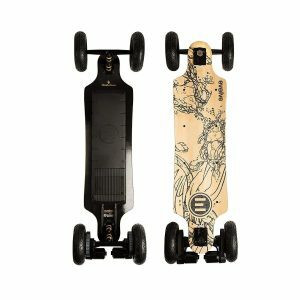 Evolve Bamboo electric skateboard’s overall design and outlook bears semblance to the original bamboo series, Bamboo GT. This is especially evident in its tough, flexible and durable second generation deck. Construction: solid-build construction featuring a blend of 7-ply Canadian maple wood and a 2-ply bamboo. Portability & power: it is super light and can, therefore, be carried along with ease and comfort. It is capable of surmounting 25% grade hills. Power and performance: dual 3000W brush out-runner motor. Evolve electric skateboard is powered by dual 3000W brush out-runner motors. The set of motors deliver sufficient power for climbing a 25% grade hill. Its high capacity Li-ion battery has a 2 hour charge time and can power the e-board for up to 21 miles nonstop cruising. Bamboo GT electric skateboard is designed lightweight and cruises at top speeds of up to 26mph. It comes with 4-speed settings depending on the user’s level of experience. The LCD screen also displays the battery’s charge status and system diagnosis. 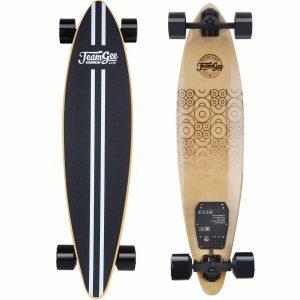 Bamboo GT series e-board has a very tough and durable deck panel made of 7ply Canadian maple hardwood and 2ply bamboo. Are you looking for a high-speed electric skateboard? The Buffalo e-board is worth checking out. 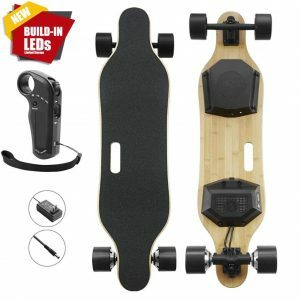 This Bluetooth-controlled longboard has up to 3 speed modes; advanced (40km/h), cruise (20km/h) and beginner (18km/h). It is, therefore, suitable for novice as well as expert riders. The deck is made of 4-layered bamboo and fiberglass for durability and strength. The deck is also designed flexible therefore capable of accommodating large load capacity. 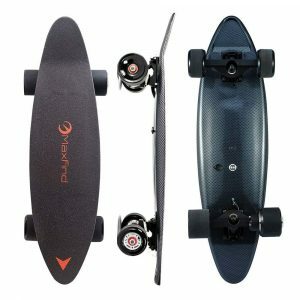 For a smooth riding experience, Buffalo e-board rolls on durable high grip Polyurethane wheels. The wheels are shock absorbent, dustproof and also waterproof. This revolutionary e-board is powered by an energy efficient 1,200W brushless hub motor. Its single dual drive system is ideal for rapid acceleration and braking. It also comes with sufficient power to take on steep inclines. And because it is Bluetooth controlled, speed regulation and braking is much more comfortable. Design and construction: the deck is made of 4 layers of fiberglass and 4 layers of bamboo for strength and durability. Wheels: durable waterproof, dustproof shock absorbing wheels. Buffalo electric skateboard is Bluetooth controlled. It, therefore, allows easy speed regulation and braking. It has LED lights for easy navigation at night. Buffalo e-board has a 6-month warranty for free maintenance and accessory replacements. It supports 3-speed modes hence suitable for entry level as well as advanced riders. Buffalo e-board is powered by a high capacity Li-ion battery capable of up to 25km nonstop rides on a single charge. Improve your urban transport experience with an award-winning e-board. 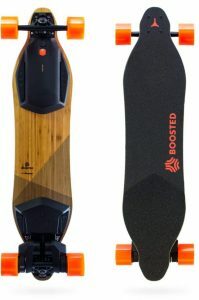 Boosted 2nd Gen dual+ standard range electric skateboard combines portability and power for unparalleled smooth rides. Powered by a 2000W brushless hub motor, Boosted e-board is perfectly suited for long range cruises. Its dual drive system supports high-speed cruises. It also lets you surmount steep hills without breaking a sweat. Its standard battery is ideally suited for 6-mile rides. For extended range, you only need to swap to the extended range 12-mile battery. Choose your range and get to enjoy epic rides and longer commutes. Portability: Lightweight and can be carried comfortably. Power: 2,000W dual brushless hub motor system with traction grip tape. Control: high-performance Bluetooth remote control. The 2000W dual hub motor system delivers enough power for high-speed cruises. Boosted electronic skateboard’s brakes are expertly engineered for rapid stops. The high-performance dual hub motor system also allows for effortless steep hill climbing. It has a high capacity battery perfect for longer commutes. Enjoy excellent control with the Bluetooth-enabled remote system. With top cruising speeds of up to 22mph, Boosted electric skateboard is capable of up to 7 miles nonstop rides. Weighing only 3.7kg, this penny board is extremely portable. It is perfectly suited for everyday commutes. And it is also approved for air travel. Enjoy cruising at top speeds up to 20km/h for a 16km range. It is remote controlled and comes with 2 riding modes. This makes it safe and ideal for the novice as well as expert users. The stiff deck flex mode ensures high-grade stability even during a high-speed chase. The Max C cruiser mode allows for acrobatic maneuvers on pavements during those nerve-racking rides. Warranty: 6-month warranty for repairs and accessory replacements. It is designed lightweight, only 3.7kg, for enhanced portability. It is colorfully printed by hydrographic transfer carbon fiber material. This greatly improves the skateboard’s aesthetics and looks. It has 2 riding mode, stiff deck, and Max C cruiser, therefore very safe for the novice as well as experienced users. Maxfind e-board supports top speeds of 20km/h and a max travel range of 16km. For free maintenance, repairs, and replacements, Maxfind electric skateboard has a 6-month warranty. Enjoy a smooth, long and exhilarating riding experience with Evolve skateboards. The Carbon GT series e-board has a range of up to 31 miles and top speeds of 26mph. With a distinctive colorful GT carbon fiber deck, this skateboard is built with the user’s safety, stability and comfort in mind. Turn street corners into apexes and open stretches into runways with Evolve skateboards. A set of twin brushless hub motors with sensors delivers 3000W of power to the e-board has 84mm hybrid wheels for an exciting smooth ride. The GT carbon skateboard blazes new paths on all kinds of terrain; rough, even or hilly. Carbon GT electric skateboard deck is made from custom moulded carbon fiber & Kevlar for strength and durability. It is designed 306mm and 12 inches wide for superior stability during rides. It also features 7-inch all-terrain wheels and 84mm Evolve street wheels for a smooth riding experience. Carbon GT electric skateboard is powered by custom-made 3000W brush out-runner motor with sensors. The motor drive system is capable of top speeds of 26mph for a range of up to 31 miles. It is lightweight and can, therefore, be carried comfortably anywhere you go. That marks the end of our review of some of the best electric skateboards. With the detailed descriptions along with features and pros, you can be sure to find an e-board that suits you best. Also, remember to check out our Amazon links for the best price deals.